So, okay, I've lived in some cold places throughout my years of being both a military kid AND a military spouse. I've been in Massachusetts, Nebraska, Wyoming, England, Germany, and Oklahoma. These are all places that are used to the chill. Most are prepared for snow. Then we moved to Texas, and I thought we'd get some tame winters. We did last year and I was all, "Sweet! No more snow and ice!" Because guess what? We've already had snow in December. Not a lot, mind you, but enough to make Texas panic. No one knows how to drive here to begin with. Add snow and ice, and it's chaos on the roads, so San Antonio tends to shut down. 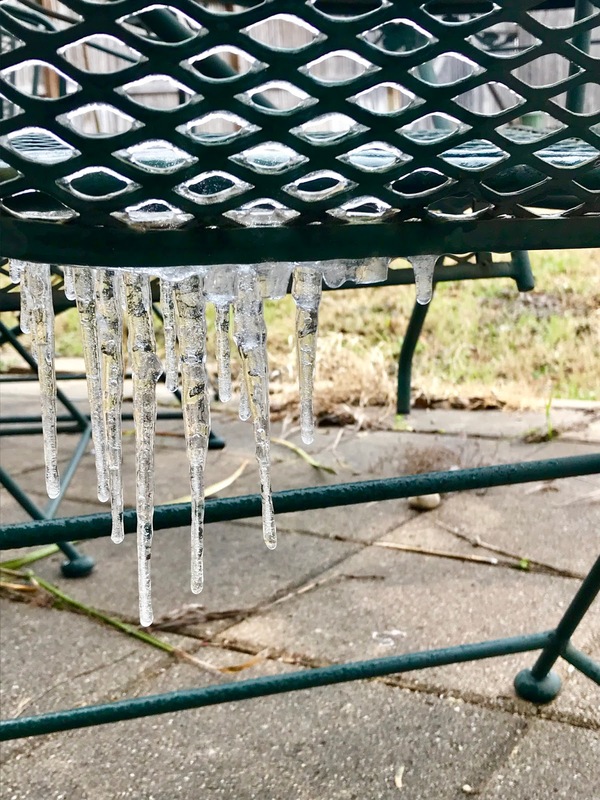 On Tuesday we had an ice storm blow in, and the city did shut down. My son was like, "Please no school, please no school." And he got his wish! School was canceled. 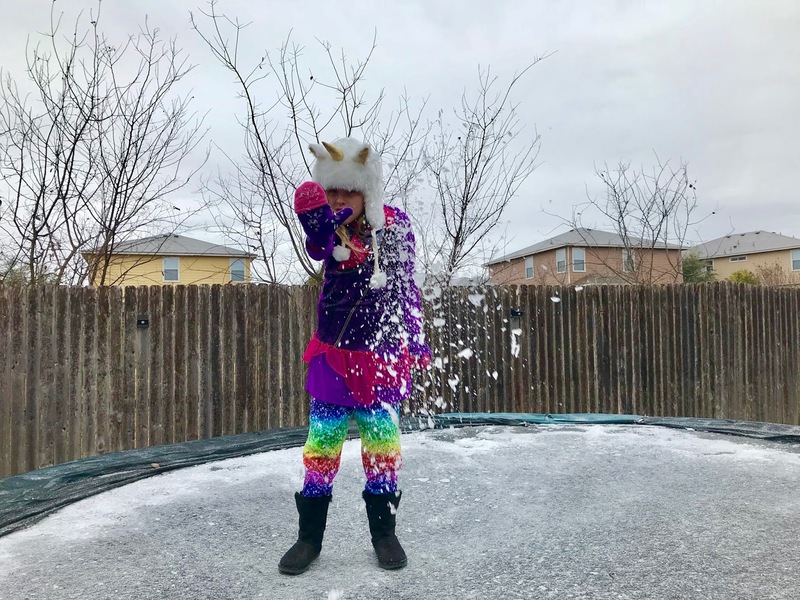 It was our first snow day in Texas. Even when it snowed in December, the kids still had to go, because it had melted by the next day. When the kids get a snow day, you might not know what to do with them. But I have some easy ideas! 1. Make unicorn hot chocolate. We love it! Click here to find out how to make your own! 2. Start a new show or movie. I started to watch Stranger Things. I always hear how great it is so I thought, okay, I'll start it. My daughter got hooked too. We're still on season one. She's all, "I need to ask my friends if Will comes back okay!" 3. Play in the snow. Well. If your kids are older, you can stay inside in the warmth and let THEM play. My daughter did. 5. Do nothing. I mean, if you have older kids, you can relax. They're old enough to entertain themselves. If they want to craft, they can get the crap out. If they want to cook, they can get the crap out. It's pretty amazing. I'll be honest: my son stayed in his room most of the day and only emerged to eat. My daughter and I did watch Stranger Things, but then she was busy making videos of her Littlest Pet Shop toys. She went outside and I took some pictures, told her not to get frostbite, and came back inside. I am not one of those people who enjoys the cold. Some love it and are all about the snow. I am like, "Get back up to the 60s, stat." Good news though! In the next few days, it will be back in the 60s. My daughter says she'll miss the snow. I will not. During the snow days, I usually get lots of blogging and planning done! It's one of my favorite type of days! Snow is becoming more common in the south, so they'd better start getting used to it LOL! I laugh because I am from Massachusetts and we get LOTS of snow. We are having a snow day now here in NC. Today makes day two. We also had a couple of days last week. P.S. Do your daughter have a YouTube channel for her LPSs? I have two girls, aged 9 & 11, and they LOVE watching those channels. Not yet, she's only 10, and she has to be 13 to get a YouTube channel. I might start letting her make videos on my channel though because she loves watching them. Right now she just saves the videos to her phone. Oh these snow days, I only like to watch it through the window but tell me to go out and I dread it, these are great activities. I like snow when I'm at home sipping hot chocolate on the couch, but since I usually work and going around is a pain, I prefer not to have it. Living in Toronto, Canada, we get lots of snow. I used to like snow a lot as I go snowboarding. Now, I just prefer to do nothing when there is snow. I started to dislike the cold. I like having four seasons. I don't like it when there's tons of snow (we recently got 18 inches) as not everyone uses good sense while driving out there. Here in SC, we usually get one or two snow dustings each winter. So far, both of the "snowstorms" missed us by about 10 miles. My grandkids were so disappointed. Me, not so much. I'm a summer person. Bring on the heat. We did almost nothing on our snow day. We baked cookies! Is Stranger Things really ok for kids? So many kids watch it but I thought it was creepy! I guess Natalie is into that! Ohh baking cookies sounds nice, and the eating them after probably even better haha! I saw unicorn hot chocolate and couldn't really think of anything else. I recently made unicorn poop cookies and I've been into the craze ever since! Honestly I totally agree with doing nothing. Sometimes it's the perfect excuse to not feel guilty about it either! We have snow days for almost a week now, our road condition and the frigid weather is unbelievable. I recruited my children to help me clean yesterday lol. Bundle up everyone, including yourself and go outside and play. Come in and make hot chocolate for everyone with some homemade cookies. We have plenty of snow days here. In fact, the kids had off most of this week. My son is in cyber school, so to keep things fun I give him a "snow day" when his local district has off. He went on a Stranger Things binge, too. In Chattanooga we usually have some snow but with 2 mountains which get more, it will shut the schools down more and the valley can be fine. I just hate this cold - 8 & 12 the past 2 mornings. Lovely post. I think there is nothing better than watching a movie with a cup of hot chocolate. I totally binged watched a few shows during our recent Snow Days. It was GREAT! Just lounging in my pjs all day long was the best thing ever. NC did the same thing to me last year! I moved from Ohio and last year was milk and I was like OH, YEA! and then now we are like on our 5th snow day for the kids. For snow that would be business as usual in Ohio... Good ideas! I love these ideas, I have to admit on a snow day for me I like to curl up with a hot cup of tea, blankets and pop on a good movie! We didn't have any snow in London but Scotland was all white. So jealous! why is everyone having snow?! i have to admit it might be quite unusual in texas! Im sad we haven't had any snow up north this year! We would have loved to get out in it or enjoy a few snow days. Fab ideas. She looks like she is having the best time playing it the snow. Best part of getting cold is coming in for hot chocolate & snuggles! I'm definitely not used to the cold but we are enjoying it here in Kansas! I hate snow. Grew up in it. Lived in it for 4 years in the Midwest. I don't even want a day of it. VA shuts down too. This post is so cute. I hope you guys stayed warm and had some fun. Thanks for sharing. I love all of these ideas! The unicorn hot chocolate sounds DELIGHTFUL!! Is there anything better to do on a snow day though besides nothing?? LOVE IT!! Thank you for sharing this. I personally love snow as it doesn't happen to have one in my country. I need to go to snowing countries like US or Germany to play with it. It excites me actually. The idea of trampoline seems nice but be careful not to slide because of the hardened melted ice. I loved snow days while I lived in Boston. 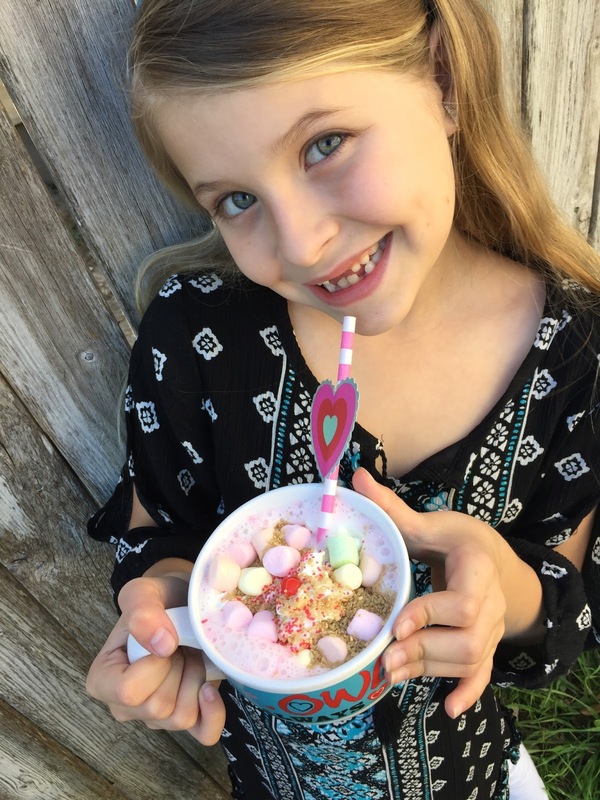 That unicorn hot chocolate looks amazing and I want to make it for my girls! I love watching series or movies with my kid and we'll try a unicorn hot chocolate! Snow days are just the best. This will make them even better! As I live in So Cal I definitely dont get snow days but I wouldnt mind one. That unicorn hot chocolate looks amazing. Yum! Love the unicorn hot chocolate, so cute!! Living in California we don't experience snow days unless I head to the mountains. Cold weather makes me want to do nothing but sometimes I'm in the mood to cuddle up in blankets and watch a great movie! Those are the best days. I love cold winter days except when it dips to polar temperatures and drags on and on for months. If that happens, I morph into a couch potato and do nothing but snuggle under a warm blanket, binge watch the shows I missed, and enjoy lots of hot cocoa! I want some unicorn hot cocoa, lol. We don't get snow here but we actually had some for a couple of hours one day. I was like a kid at Christmas. I like cold weather because it is so comfortable to be lazy. lol! I would love to drink that unicorn hot cocoa and read a book. I wish our times in MA could have overlapped! I teach my kids Billy Madison quotes too! "If peeing your pants is cool, consider me Miles Davis!" You nailed it, though. As a kid, we'd play Nintendo and then play outside and then get hot cocoa and rinse and repeat. Unicorn anything.. yes.. Books.. Stranger Things..
We have been fortunate (in my opinion) this year in CT but supposedly we are getting some this weekend so let the fun begin. These are such cute ideas! You know, I have never seen real snow!! I live in South Australia... one day, I need to travel and experience it. I would love that! Everyone get all bundled up and go out and play in the snow that is what it is for. Come in and make a big cup of hot chocolate and start a movie. I only want snow on Christmas. I'm always dreaming of a White Christmas. When we lived in Oklahoma for a few years I did get my wish. But, I'm not really a snow or winter person. Snow days are fun here the kids love to be home from school, my husband gets to use his snow blower toy and then we all drink hot chocolate and watch movies. If there is a lot of snow they all go sleigh riding. Such good ideas! Totally saving this. We haven't had a snow day yet this season but I knoooooow it's coming soon! We're getting snow tomorrow night and this weekend. Your tips would be perfect for our next snow day. We usually have some snow, but it is never supposed to be a lot. We started off December with 13 inches!! I'm not really a snow person. We have yet to have our 1st snowfall of the season. *sigh* However, snow is predicted this weekend and I, I mean the kids, can hardly wait. okay this looks so fun! I'm so jelly over here in Georgia...we have dirt! You guys are having a BLAST!! We had snow last year in the UK and I hated it still waiting to see if there will be any this year. I am ready for it. It's funny because we are excited for snow days, but then there tends to be a lot of cabin fever too. It's good to get the kids outside and burning off energy! I do not like snow. We had our snow last month and got 2 inches but that is a lot for Albuquerque. The town shut down for a day. Born and raised in the northeast, I know snow well enough too. Snow days can be fun with the kids as they are usually happy to have a day off of school. Your activity ideas are really cute! I'm becoming such a fan of your blog. And yes you're right: one of my besties lives in TX and OMG they are all the time complaining about this cold winter season. Thanks for sharing! We rarely get snow around here. 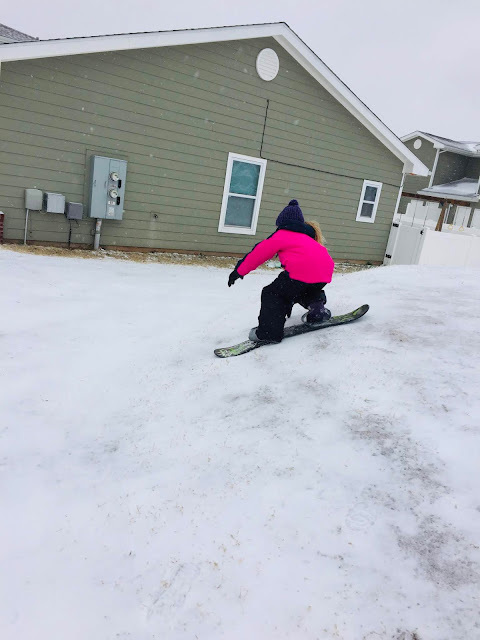 When we do, we love to make hot chocolate and take my daughter outside to play in the snow. It doesn't snow here. BOO! So our winter activities look very much like our Summer activities. What a list of awesome ideas! That unicorn hot chocolate looks like something my niece would love to enjoy during the snowy days. That was totally cool! but in my country, we don't have snow I really really wanted to experience the winter season! I will surely apply these ideas! These are some great ideas. If the snow lasts a week like it did here last year then you may want to come up with even more ideas. I got on my snow gear and walked to the beach, lol! 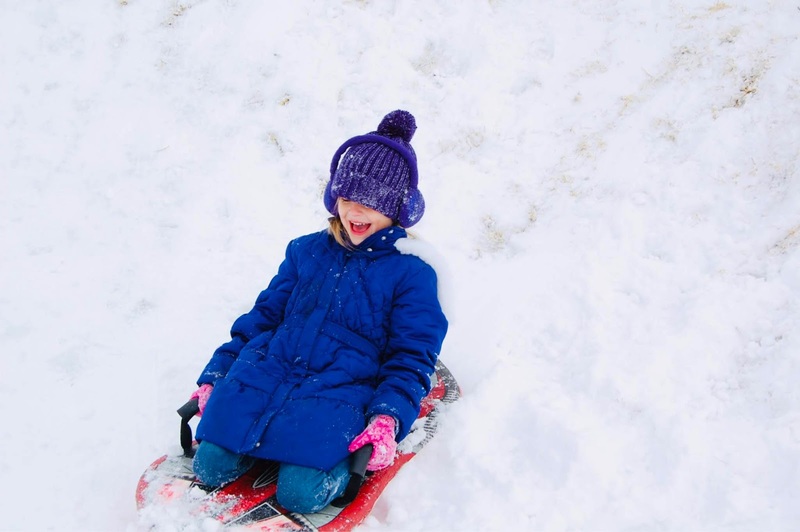 These snow day activities will surely light up any cold winter season. I'd love the hot chocolate too! Looks so yummy!! I grew up in southern WV where many of my childhood winters we had snow. In the Tennessee Valley we don't get a lot of the white fluff. Ice is the real monster but like Texas our school system will shut down even if there's a sprinkle of snow in the air. Okay, that's an exaggeration but you can relate to what I'm saying. When we moved here in the summer of 1979 I was in my senior year of high school. Yes, I was a child bride and I recall people telling me how the schools were with the snow. Surely they gest I thought but I soon learned that to be the truth when school was cancelled with snow barely falling. We kids of southern WV would pray and pray for the salt truck to break down so we wouldn't have to go to school but guess what? That never happened and we trudged to the bus stop with several inches on the ground, snow falling heavily on our heads, and roads covered in slush. It was miserable weather. We had a cancellation yesterday due to freezing rain but we couldn't do anything outdoors. We did what's on your number 5, do nothing lol. Hahaha I can totally relate! I just moved from Alaska to New Jersey and felt totally in control. They say we should expect two snow storms this weekend. At least it's not half as cold as Alaska. I don't like snow anymore but when I was a kid I used to love it. There was no better day than the one where I would wake up and the ground was covered with snow. Sledging was my favorite snow play. I love the snow. One of my favorite activities is making snow cream. Use clean, freshly fallen snow (about 8 cups), whole milk or cream and a bit of vanilla. I start with a cup of the liquid and stir until incorporated, then add more liquid until I get the firmness I want! We have more snow coming this weekend! I love snow. It was my favorite growing up. I get why adults grumble but I still have fun playing out with my kids. In India it never snows, but in Canada it does and I love sleeping there. Haha! I currently live in Wisconsin and have previously lived in Wyoming as well (where did you live??). I was born in Texas, though, so I know the total shut-down that happens when it snows there. It's almost comical after you've lived somewhere that gets REAL Winter, but they really are just not equipped to deal with it! 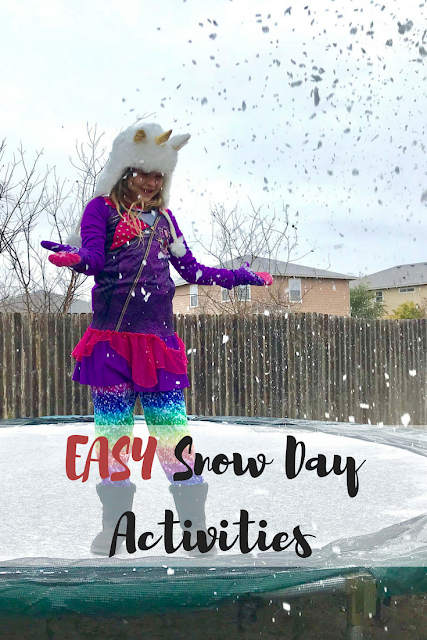 Love these ideas for fun Winter activities though!! Snow days here are far and in between but when they happen we definitely make the most of them. The kids are typically out of school FOREVER. I really don't like winter because the layers of clothing are affecting my neck and back. But I want the kids to experience snow, so we will schedule a visit to a land with snow sometime in the future. I very much like the idea of "doing nothing!" Thanks for letting me know it's still okay, haha! So much fun! I miss snow days.